The next-generation Volkswagen Touareg is set to debut in Beijing this March. Volkswagen will introduce a redesigned, reengineered, third-generation Touareg at the 2018 Beijing Auto Show this March. But before Volkswagen's most expensive model crosses the stage, the German automaker is teasing its SUV's new lines in a single, solitary sketch. 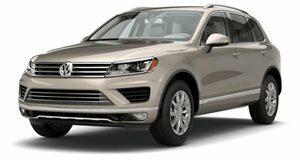 The Touareg , but it's as a 2019 model riding atop the MLB Evo platform used by the Audi Q7. As expected, the looks set to mimic the , which was itself shown at the Beijing Auto Show two years ago. The Touareg's grille will grow to follow current design trends that dictate such a necessity, especially in China where larger grilles are seen as being more premium. However, the SUV's body—which VW confirmed will ride atop air suspension—won't deviate far in shape or size from that of its predecessor, thus leaving the Atlas as Volkswagen's largest vehicle in its American lineup. Volkswagen didn't give drivetrain details, but expect a V6 gas engine and a possible electrified model to arrive on American shores. Expect the to fetch at least $50,000 when it starts hitting dealer lots in late 2018.